Entrepreneur Adam Noble held an open house to unveil Noble Purification’s new bio filtration facility. The Peterborough CFDC was there along with dozens of others to celebrate their successes. Noble Purification received an Eastern Ontario Development Program $100,000 non-repayable grant to help offset the cost of purchasing some of the equipment. There is a 180-year-old wooden barn on Roger Harley’s farm. But no animals live inside it. 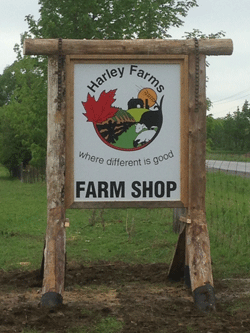 Harley’s 400-hectare farm, two hours northeast of Toronto near Peterborough, provides a viable alternative to industrial farms — financially and practically. He figures he makes as much per acre as an industrial farmer. But for animals, it provides something the industrial model does not: a good life. His pigs don’t spend their lives in small, solitary steel cages. They live in families, on acre-large (0.4-hectare) lots, where they can root and wallow in the mud, and raise their young. “That’s the sound of a contented pig,” says Harley, listening to a sow grunting and chasing after her piglets. While most industrial farmers pick breeds for weight gain, Harley searched for hardiness. He raises 130 Belted Galloway cattle, 700 Tamworth pigs and 850 Wiltshire Horned sheep, which all can withstand the cold. He does no mutilations, besides boar castrations performed with anesthetic, and no artificial insemination. His animals make babies the old-fashioned way. The great Canadian butter tart debate doesn’t usually extend beyond the merits of plain versus raisin versus nuts. 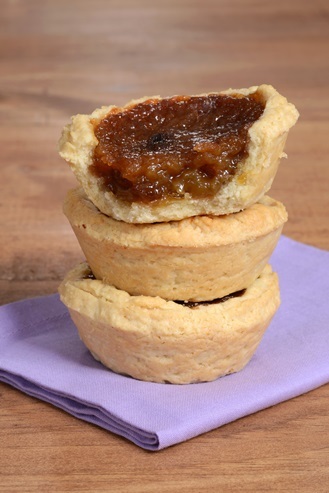 Barb Rowlandson, the staunchest of butter tart aficionados, decided to throw the word “freestyle” at bakers in this year’s Ontario’s Best Butter Tart Festival and Contest. Professional bakers obliged with the likes of pumpkin, maple cheddar bacon, French truffle, eggnog, Nutella raspberry, cheesecake salted caramel, and peanut butter and jam. Diane Rogers from Doo Doo’s bakery in Bailieboro won in 2014 and again in 2015, this time for her Pumpkin Tarts. Next Millennium Farms is rapidly growing its operations to scale up cricket farming to industrial size. Sciens Industries has been named a new supplier for the Boeing 777 through supply of high-precision machined components with deliveries to begin December, 2015. This multi-year contract is set to support production of the Boeing 777 landing gear. Based in Peterborough, Ontario, Sciens Industries has experienced tremendous year after year growth. As a member of Peterborough’s burgeoning advanced manufacturing industry, Sciens has been positioning itself to take advantage of the Canadian/US dollar disparity by pursuing export into the US market. With the awarding of the contract, Sciens has vaulted forward as a production level manufacturer within the global aerospace industry. Sciens Industries Inc. specializes in the manufacture of intricate and exacting build-to-print CNC machined parts and components for the Aerospace, Security & Defence, Oil & Gas, and Nuclear Energy industries. The privately held company was founded in 1997 in Peterborough, Ontario. The project will create a new 7,150m² home for the prestigious not-for-profit museum next to the Canadian city’s historic lift lock. 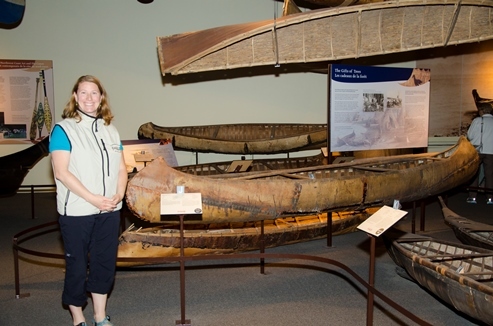 Founded in 1957, the Canadian Canoe Museum currently hosts around 100 canoes and kayaks inside a 1980s building and former warehouses in an industrial district nearby. The new museum will replace an existing 1980s visitor centre on a 7,500m² site next to the landmark hydraulic boat lift on the Trent-Severn Waterway. The facility – expected to receive around 60,000 visitors in its first year – will include permanent galleries, an outdoor terrace, a conference venue, restaurant, bar, café and artisan workshops. Second generation Canadian homeschoolers with a passion for math, Alesia and Matthew Blackwood have been working hard to create an effective and easy-to-use math program for older students. Now available for grades 7 and 8 with more levels currently in the works, Unlock Math first focuses on Pre-Algebra as a base for future lessons. Completely presented online using videos and interactive practice activities, the daily lessons are easy to follow and complete. The FAQs sections says that an average lesson takes about 30 minutes to finish. Alesia is a certified math teacher whose love of math shines through in her videos as she teaches in a way that is fun, bubbly, and clear for students. Each lesson begins with a warm-up exercise to get minds focused on math, an instructional video, practice activities and review questions from past lessons, a challenging bonus question, and printable reference materials. Visit their demo lesson available on the website to see how the layout works.